How do you teach “Compassion” and “Empathy”? When I was working in the hospital as a nurse, I was always misplacing my stethoscope, only to find it hanging around my neck. Now, with Rainie in my life, I am perpetually doing the same thing with her leash. I’ve discovered that the neck is a very handy place to put it – so I’ll always know where it is. Except I usually forget it’s there. I was reminded of this as I was hurriedly trying to put everything in order to go talk to the local nursing program’s class that is studying pediatrics and chronic illnesses. 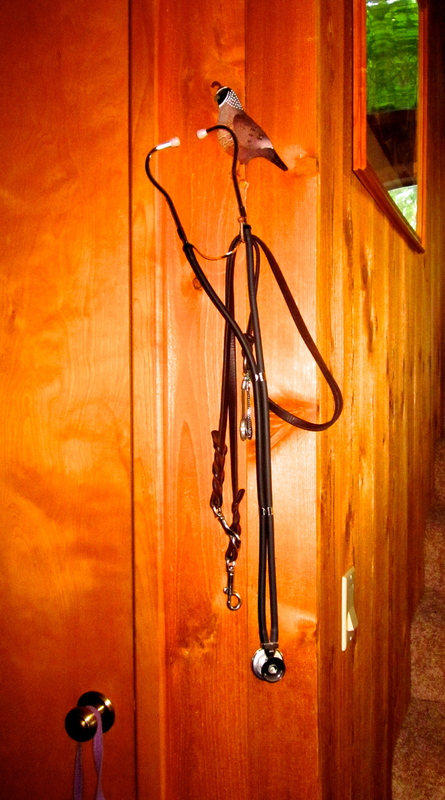 As I was attempting to get Rainie and the gear into the car, I couldn’t find the leash because it was around my neck! In preparation for my talk on “the psychosocial impact of choric illness on the individual, family and society” (as well as diabetic alert dogs), I asked the students to read “How Does It Feel” from this blog site. I wanted to try to show the students the impact a nurse can have if he or she tries to put herself/himself in the position, or shoes, of the client, and look at issues from that orientation. I discovered this is much easier said than done. “Empathy” is something one develops with maturity and experience. I asked what issue do they (the students) think is the biggest fear of having diabetes, or having a child with diabetes in the family. The major response I heard was the fear of going blind from long-term complications. This is not what I was expecting from a class that had already covered the biology of diabetes. But, at the same time, I could see where they got this idea from – I remember the doctors talking to me about ‘maintaining my diabetic regime’, or I might go blind!! The doctors were using the scare-tactic on me in order to get me to follow their rules. This must be what the students are being taught in this program. I told them I had hoped they would talk about the daily problems of the diabetic’s blood sugar of going too low. Low blood sugar (hypoglycemia) will quickly cause altered thinking, poor judgment, dizziness, accidents, unconsciousness, and, ultimately, death. We explored what it might be like living with this constant fear, and the life changes that must be made in order to avoid hypoglycemia and long-term complications. We discussed how the first thing a nurses must assess (measure) when meeting with a client is the client’s fear and degree of acceptance of a diagnosis, and find out what ‘burning questions’ they may have. Without doing this first, no other teaching can happen – especially if the client is truly anxious, agitated or angry. And, the diagnosis of “Diabetes” tends to bring with it a lot of fear and anxiety, especially if it is in a child. We explored how, in a perfect family, the whole family might adapt to the new food requirements and exercise plans, as well as be involved in learning what diabetes is all about. The family and the patient are the nurse’s client. I talked about how the patient may have an appointment to meet with a nurse in order to learn or review a myriad of information, but, even though the patient may look ‘fine’, their body might be in a bad metabolic/chemical state due to blood sugar problems. This makes the nurse’s job of teaching more difficult, and possibly frustrating for both the nurse and client/s. There was so much we could have covered, but I only had an hour, and the instructor had asked me to show how a nurse would teach someone (a family member, a teacher, a school nurse, etc.) how to give a Glucagon injection. (Glucagon is a hormone that should be injected into a diabetic if the diabetic’s blood sugar goes so low that she/he is not able to eat, becomes combative, is having seizures, or becomes unconscious.) I brought two expired glucagon kits with me so the students could actually handle them, and mix the two ingredients together as if they were going to teach someone how to inject the Glucagon. The example I gave was for the students to teach a grandmother how to give a Glucagon injection to her 3-year-old granddaughter, who was having seizures due to low blood sugar. Before we cracked the cases open, I asked the class if anyone had ever given himself or herself an injection. All the faces, but one, dropped with an expression of horror! “NO!” I asked, “Why not?” I suggested that the next time they had to get a flu shot or tetanus shot, to ask to give it to themselves, then imagine what it might be like for a parent to have to learn how to give their first insulin shot to their child, or, as in this case, what it would be like for Grandma. The room became very quiet … Next, we figured out how to break open the plastic box the glucagon kit comes in, uncap the syringe and needle, inject the fluid from the syringe into the glass vial containing the powdered glucagon, agitate the bottle to mix it, and now teach “Grandma” how to give the injection. I believe my asking the nursing students to imagine doing this to themselves must have “freaked-them-out” because most of them were “all thumbs.” After much giggling and dropping of the bottles, my time was up. For me, this opportunity was priceless. I haven’t “put my nursing hat on” for a long time. As for the students, I hope they took away a slightly different perspective of life and the teaching process. I’m always amazed how a little thing, like a simple sticker in this case, can cause an “Ah-ha” moment. 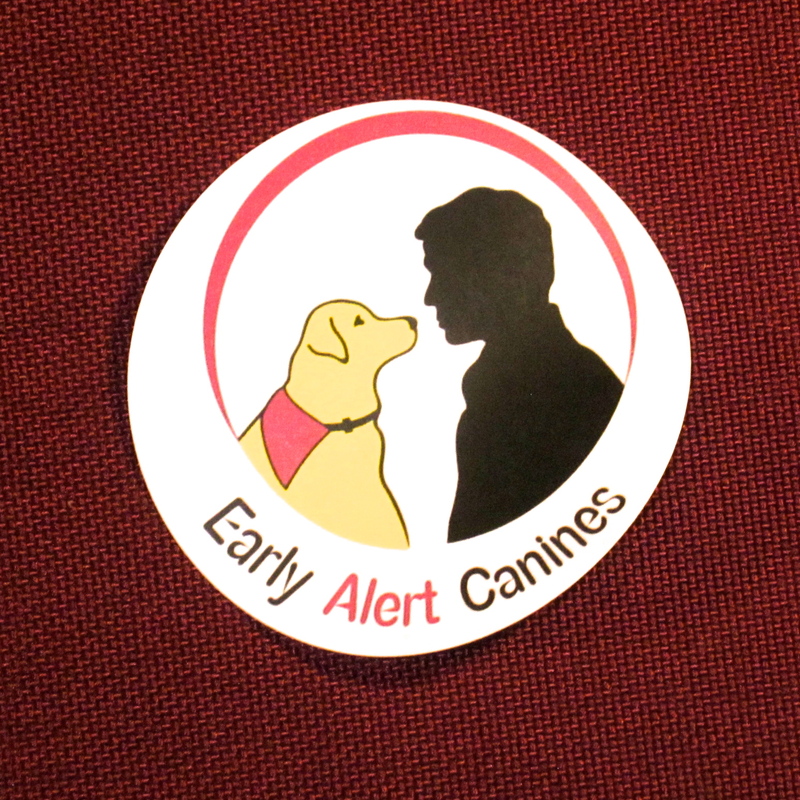 Recently, I’ve begun offering EAC stickers to those interested, which seems to delight kids of all ages. (The little ones assume it is a picture of Rainie, and are pleased to be able to take a picture of her home.). Today, a girl of about 8 approached. She was shy as she gently knelt down and wrapped her arms around Rainie’s neck. She seemed very interested to learn about what Rainie does for me and how she was trained. She seemed to leave only because her mom was calling for her. She happily accepted a sticker, and Rainie and I proceeded on our way. Not long afterword a woman, being led by the young girl, came hurrying up to us. The mom told us that they had been searching the bustling market to find us in order to find out more about Rainie and EAC. Apparently, her daughter had given the sticker to her, told her about our conversation, and had asked if she could send the sticker to her cousin in Michigan. This cousin had been diagnosed with diabetes at the age of 7 months, and is now 3 and a half. His family is having trouble with the toddler going low at night, and has been trying to find information about diabetic alert dogs, but couldn’t find anyone willing to talk with them because the boy is so young.